I think we can all agree that one of the best parts of summer is the fabulous fresh berries that are available. Most berries, like strawberries and raspberries, I love eating plain from a bowl. Blueberries, on the other hand, I think are much better when cooked. I like plain blueberries, but when they are cooked and turned deliciously juicy and purple they are just so much more wonderful. So, when we had a ton of blueberries in our refrigerator last week, we knew that we wanted to bake with them. Finally it hit us- blueberry pie! 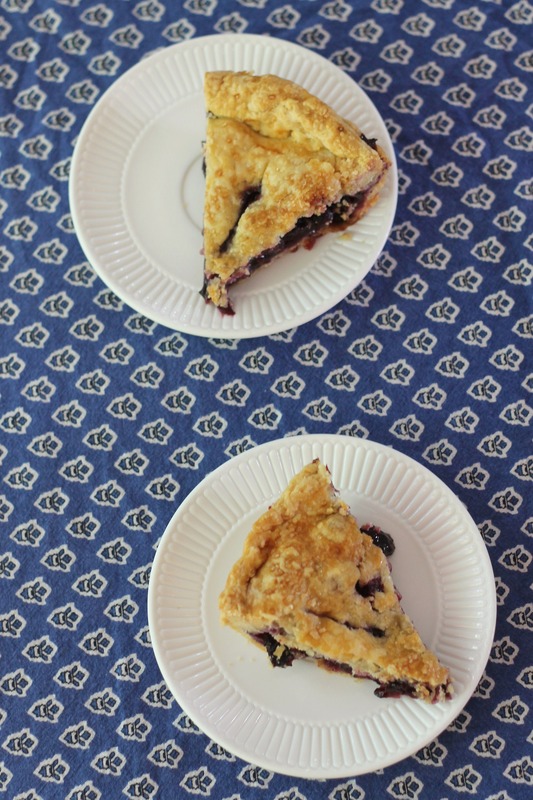 Pies are delicious, but we rarely make them and had never tried making a blueberry one before. It was the right decision, let me tell you. This pie was magical- the crust was flaky, the filling was both sweet and tart at the same time, and it was really easy to make. I think the secret to making this pie so excellent was the lemon and cinnamon in the filling. These two flavorings were key to preventing a flat, blah filling. This pie is sure to become a summer baking staple! One thing to note- while the pie tasted better warm, it is MUCH easier to slice when fully cooled in the fridge. Mix the flour and salt together in a medium bowl. Cut in the shortening and butter using a pastry blender or two table knives until the largest pieces of butter or shortening are the size of small peas. Sprinkle with the cold water, 1 tablespoon at a time, until all the flour is moistened and the dough almost leaves the sides of the bowl. Gather the pastry into a ball and divide into two. Flatten each piece a bit an wrap in plastic wrap. Refrigerate for about 45 minutes, or until the dough is firm and cold but slightly pliable. Roll the pastry on a lightly floured surface (rolling it on a piece of lightly floured parchment paper makes transfer easier). Make sure the circle is two inches larger than an upside-down 9-inch pie plate. Gently press the pastry into a 9-inch glass pie plate. Take care not to stretch the pastry, which will cause shrinking. Put the blueberries in a large bowl and toss with the lemon juice. In a small bowl, stir together the sugar, cornstarch, lemon zest, salt and cinnamon. Sprinkle the sugar mixture over the berries and stir to evenly coat the berries. Right after assembling the filling, transfer it to the dough-lined pan. Dot with small butter pieces. Place the second dough round that has been rolled out on top of the pie. Crimp the dough rounds together to seal the edges.Cut vents in the pie with a sharp knife to allow steam to escape during baking. Refrigerate the pie for 20-30 minutes. Meanwhile, place an oven rack in the lower third of the oven and preheat it to 375 degrees F. Beat the egg with the water and brush over the pie. Sprinkle with turbinado or granulated sugar if desired. 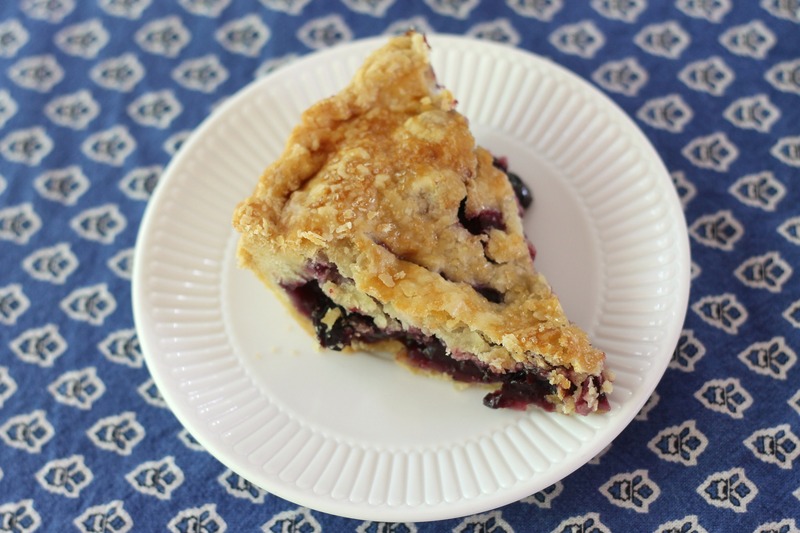 Place the pie on a foil-lined baking sheet (to catch any bubbling blueberries that escape). Bake the pie for about 50-60 minutes, or until the crust is golden brown and the filling is bubbling. Let cool before serving. Enjoy with whipped cream or vanilla ice cream!